Home / Food / Foodie Gift Idea: Raw Spice Bar Subscription! Foodie Gift Idea: Raw Spice Bar Subscription! It’s the most fragrant time of the year! What better time to buy the chef in your life a little inspiration? Inspiration that overflows with sensory delight every month! Raw Spice Bar brings new-to-you spices to your doorstep for the small price of $6 per month. Each shipment contains three different spice blends from one regional cuisine, and those spices are about as fresh as you can get, having been toasted, ground, and/or blended right before a shipment goes out. Past culinary locations include Punjabi, Peru, Navajo, and even Baltimore! 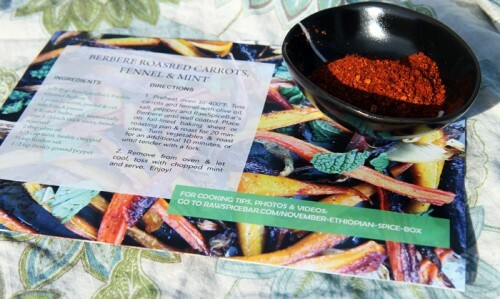 The information card explaining the blends’ histories and uses also gives the origin stories of the actual spices sent. Mine were grown and harvested by Asante Mama, “a Ugandan based innovative farming business that has helped to lift over 5,000 rural women out of poverty through farming.” How nice to know exactly where your spices are coming from and know who making your purchase impacts! Past collaborations include the Food in Jars blog and Navajo chef Freddie Bitsoie. The total amount of spices sent is 1 to 2 ounces. For spices that fresh, it’s a really good price. Your average grocery store bottle is 1.75 ounces and anywhere from $3 to $9 depending on what it holds. And who knows how long that celery salt’s been sitting on the shelf? Don’t forget that it also includes shipping! Not to mention that the three spice envelopes come with recipes, so all you have to do is head to the store for the rest of the ingredients if you don’t want to experiment with your own. I received November’s shipment to review, and I must say, the colors were enough to feast on themselves. 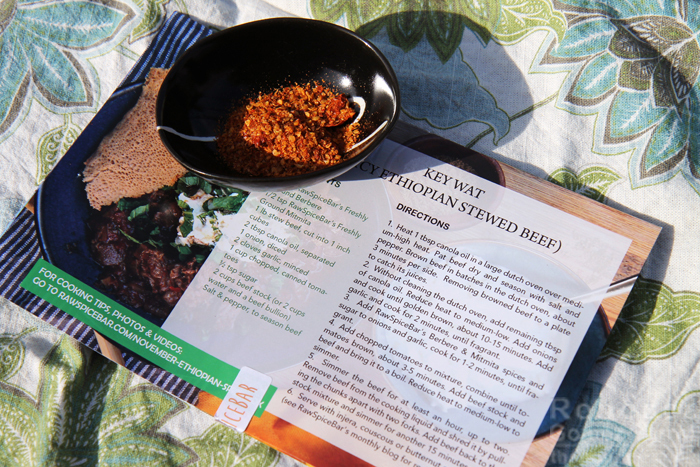 As you can see, the region of the month was Ethiopia, and I was so excited to see a berbere spice blend, something I’ve had on many dishes but haven’t happened across in stores. I tried just a taste, and wow, that’s got quite the kick! All the toasty richness is there and ready to go. I’ll be following the recipe for that one, as roasted carrots with fennel and mint sound amazing. I haven’t used the mitmita spice blend yet, either, because I’m prioritizing getting this post out before getting to try all the spices! But I can confirm that its heat kick is equally impressive. I can’t decide whether I’ll follow the recipe for a stewed beef or if I’ll go for making a savory roasted eggplant dip instead. I’m picturing intense tomato and eggplant flavor alternating with a swirl of cooling yogurt. 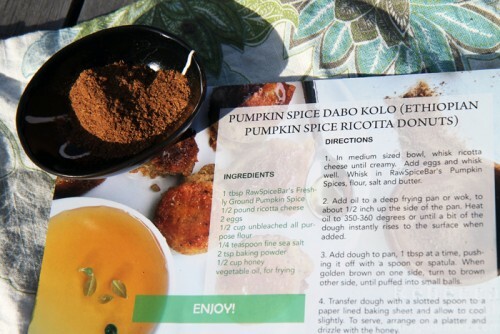 Being as it’s the holiday season, of course Raw Spice Bar sent a pumpkin spice blend for the final selection. The recipe for Ethiopian ricotta donuts looks impressive, but I decided to go ahead and try this one out with the plethora of apples I picked from our tree. It made delicious apple sauce, simply simmered down on the stovetop with apples and water. I’ve been enjoying it with everything from vanilla ice cream to sour cream pancakes—and I still have some spice blend left! Just soaking in the smell and texture of those spices is enough to get my creative cooking juices flowing, and I’m more of a food-eater than a food-maker. I think true chefs would be delighted with the monthly challenge Raw Spice Bar provided. Get yours or place a gift subscription right here. Obligatory disclaimer: I was provided with one monthly shipment of Raw Spice Bar for free for review. 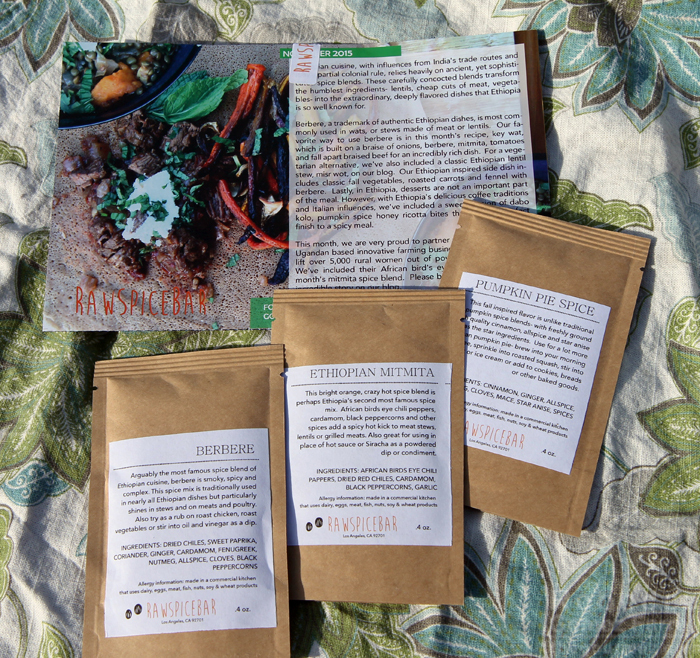 3 thoughts on : Foodie Gift Idea: Raw Spice Bar Subscription!